From Tokyo to San Jose the Sunday Morning Rumor Mill never sleeps. With Bellator and UFC shows on the same weekend your friendly neighborhood rumor mill kicked into it’s nth gear. Is Bellator having their best year in company history? How does the UFC rebound from a year with so far no McGregor, Rousey, Diaz or Lesnar octagon fights? Where do boxing and WWE fall on the combat sports’ happiness scale? The final quarter of 2017 may answer all these questions and more if some rumors track to the finish line. As always these are rumors that have been talked about behind closed doors between MMA higher ups, so take them as MMA rumors. Before your scheduled Sunday mediation time where all you do is replay all pride fights in your head, sit crisscross applesauce and ease your mind with some Sunday Morning Rumor Mill breathing exercises. Huge if true, but rumors are picking up that the UFC is trying to book Conor McGregor versus Nate Diaz part three for the end of 2017 or the first quarter of 2018. Most of the scheduling depends on what date Team McGregor wants; the UFC’s New Year’s Eve weekend, Super Bowl weekend of the first week of March (AKA the anniversary of Conor-Nate 1) have all be put on the table. 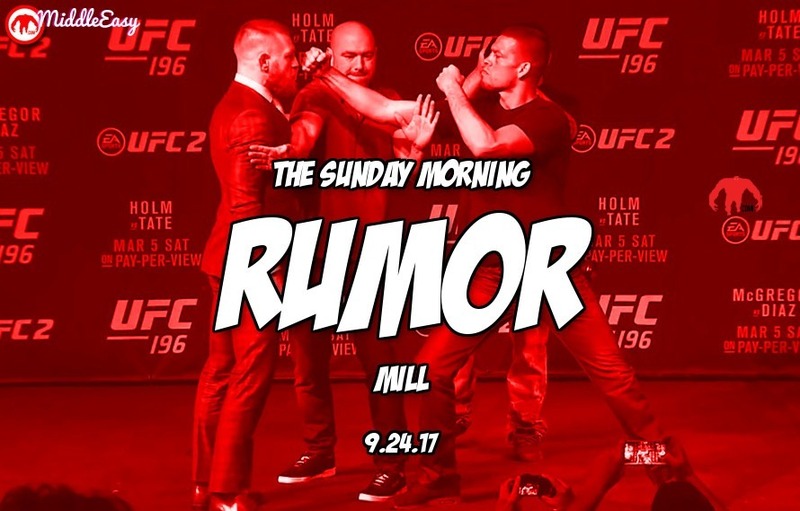 If you have heard of any interesting Sunday Morning Rumor Mill MMA rumors that you would like to add, feel free to post them in the comments section below, on our Facebook page, tweet us or mail them to us in an unmarked envelope. Just remember they are rumors and not confirmed as fact, so please take them as such.